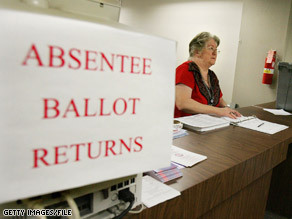 Some voters still haven't received absentee ballots. (CNN) – With less than a week until Election Day, some voters are still anxiously awaiting the arrival of their absentee ballots. Chawnte Williams, is registered to vote in the Denver area but is currently out of state. Williams reports that she requested an absentee ballot earlier this month and was informed that it would not arrive until the end of October because of printing problems. When the ballot did not arrive as scheduled, she called to check on it again, and was told by her local election officials that they had no record of her requesting an absentee ballot. “So because of somebody’s clerical error, now it looks like I might not be able to vote,” Williams said on the hotline. "I feel like I'm not going to be able to vote and there's no reason why," Williams also told CNN in a telephone interview Thursday. Colorado voters who still have not received their absentee ballot should visit GoVoteColorado.com and access Colorado’s voter registration search engine, says Colorado Secretary of State spokesman Richard Coolidge. The search engine tracks the status of absentee ballots - including whether they have been mailed out, or been returned to election officials in the mail. Sharon Sisnroy, the Otero County Clerk, told CNN that voters in her county should call or fax an application for a replacement absentee ballot. Once that request is received, Sisnroy’s office will mail out another absentee ballot. Alternatively, Sisnroy advises, voters can come to the Otero Election Division in person and complete the application for a replacement absentee ballot and then obtain the new ballot in person as well. Some CNN voter hotline callers from Florida have expressed similar concerns. Dr. Stuart Schwartz of Palm Beach County, Florida tells CNN he hasn’t received a replacement absentee ballot after he had to return the first one mailed to him because it was not the proper ballot for him to use to vote. Florida voters who are still awaiting absentee ballots should call their local supervisor in the county where they are registered, according to Jennifer Davis, of the Elections Division in the Florida Secretary of State’s office. This is an example of how the repugliCONs rig the votes to get thier guy elected. You wondering why McCain is being so smug about a "comeback" on election night? It's because the repugliCON Secy. of States taround the country (Including CO) old him "not to worry, everythings under control". That's how Bush did it in 2000 (FL) & 2004 (OH) and that's how McCain and the RNC are planning to do it in 2008. Get out and vote for Obama/Biden – Don't let the necons steal a third one! I think there should be close monetoring of these election incase of rigging in favour of the republican. Same here. I applied for an absentee ballot. The first time they said I didn't do it correctly so they sent me another application. I sent the new application in; I never got the absentee ballot. Hopefully, they just never sent it out so I can just go vote in my hometown but I will be extremely upset if they refuse to let me vote as this would have been my first election. Have you checked on what's called an Emergency Backup Ballot. They can be printed from the Internet (check google) and faxed. The only requirement is that you have requested one by mail already, and you have from the sound of your post. You are still supposed to mail the actual ballot out regardless. Hope this helps!! Year after year this is a problem.. why on why aren't people doing more to fix these problems! We are suppose to one of the greatest countries and most advanced and this all seem so basic, especially after the stupid hanging chad fiasco.. I hope there are few problems this election. Ballot problems is a bipartisan problem. Why is it that even after the 2000 Florida debacle we cannot figure out how to get the ballots right? We need a fair clean election with a fair clean win for Obama. It was had to find a place on cnn to comment even though the network avertises it. This election is the strangest on ever, ie early voting,celeberties all for Obama ect. there was a Senator Gary Hart caught on a boat with a girl which destroyed his run for President. I find it interesting with Obama s personel ties with reverands,terriest,and other groups are different than just an affair.It tickles me to see Joe Biden with a gag order on him and Palin being attacked on minor things. The public still wants to know about the charector and ties mr Obama has. The public wants to clearfy where his money came from?Are there overseas campaigns. A soccer mom has to produce a legal birthcertificate,its strange running for the most powerful office in the wworld you dont half to. Normally the media is all into alot of peoples business,like Joe the Plumber. This is another difference in this election that is strange. I think we forget alot of money was spent on the War producing a budget problem. It was as necessary as the money that went to ground 0 in New York. Well now that the gag order is on Rev. Wright, Joe Biden,a few terrorist,campaign contributions,the women with information on Obama being born in Kenya,the media,and several other items makes this a strange election. I guess alot of people get on the band wagon to stack the deck. The outcome is getting clear. When the movie stars,big and small business gets there taxes we might see a change of heart. Is that an iceberg I see? Sounds suspicious ... is this how mCCain is going to save his titanic from going down? Vote against Bish lite, vote for change! I believe this nation could use some international elections observers. I have a strange feeling this election will be stolen by the Republicians. What!!! Sarah Palin has me proud of my country for the first time in my adult life! Why is there always problems with voting in Florida? Why don't the governors, such as Jeb Bush, and Charlie Christ, ever accept personal responsibility for the blunders that always happen there? would have figured out a honest,nation wide formula for non-fraudulent elections.......go figure. To KG who wrote:"OBAMA is playing everyone for fools and he may just get away with it. As I always told my kids when they would hurt themselves doing something stupid." YOU DID IT TO YOURSELF"." If you KG have voted for bush in 04,than i guess you already told yourself the same thing you told your kids. GOOD JOB. I guess you missed that one or i guess you say one thing and you do another thing. typical. Don't let up! Fight with all your might. Vote! Vote! Vote! It's your right. It is absolutely shameful the USA cannot get its act together especially in the last few elections. Too many voter suppression intentionally, or unintentionally. Folks have bled and died to give voting rights to every citizen and some are doing everything possible to deny people, minority people. We have no bussiness trying to democratise the world until minority folks in Florida, Ohio and throughout the USA can freely exerxise their voting franchise. Don't you really want four more years of republican spending and war. According to the annual un reports, the usa is way down beeing the best country in the world to live in. The top countries are: Sweden, Canada, Danmark, Australia and so forth. Only Back Onama will bring America back to the top nations. that NOBODY WHO HAS NOT BEEN A PRESIDENT BEFORE HAS BEEN TESTED AS AS PRESIDENT. OBAMA AND MACAIN HAVE BEEN TESTED IN DIFFERENT SERVICE AREAS OF THIS COUNTRY. NONE OF THEM HAVE BEEN TESTED AS A PRESIDENT, period. I registered my sister and her father in law through the internet in the beginning of September, they have never received their voter information. Why?